Most of the natives we grow here at Prairie Nursery are available as potted plants, but we do offer a few species, mainly spring ephemerals, as “bare root” stock. Bare roots can be transplanted into the ground anytime during the growing season, but we usually recommend fall planting for these spring ephemerals, as fall planting allows the plants to emerge on their natural cycle the following spring. However, early spring is also a good time to plant bare root stock. Within the spring timeframe, a fairly early installation is needed if the ephemeral transplants are to grow significantly during their first spring. Depending upon how late in spring you plant them, the plants may experience minimal growth before they die-back into their root for remainder of the year. But not to worry, they will emerge and bloom the following spring. Bare Root plants are shipped in a plastic bag with sphagnum peat moss. They can be stored in the refrigerator at constant 34° to 38° F until you are ready to plant them. Stored roots should be covered with slightly damp – not wet – peat moss. Do not allow them to dry out or freeze. During the transplanting process keep the roots protected from exposure to sun or wind and don’t let them dry out. Dig the hole for a transplant deep enough to accommodate the entire length of the root. Do not bend roots into a hole that is too shallow, as this will retard growth. 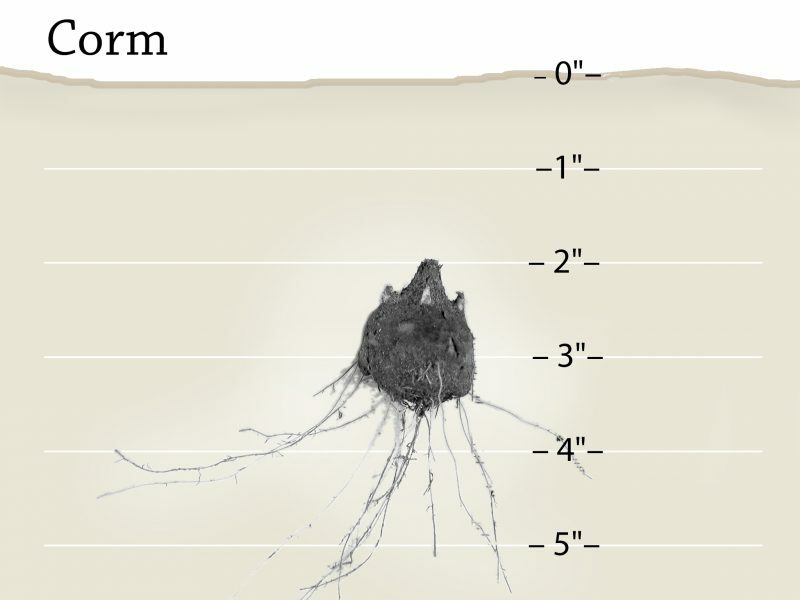 Place the roots up against the “wall” of soil that is created by the digging of the hole. Position the plant so that the buds are at the proper depth for that root type (refer to the examples below). Spread the roots out to maximize contact with the soil. This will allow for rapid establishment by encouraging maximum absorption of water and nutrients. Next, place soil firmly around the roots. Make sure that the soil is in a condition that allows full contact with the bare roots, at all points. Avoid compacting the soil. Compacted soil impedes water and air movement to and from the roots, which can suffocate the plant. Clay soils are particularly prone to compaction, especially if they are worked when wet. Never transplant into wet clay soils. Do not pack the soil directly above the buds. This can damage buds and retard emergence. 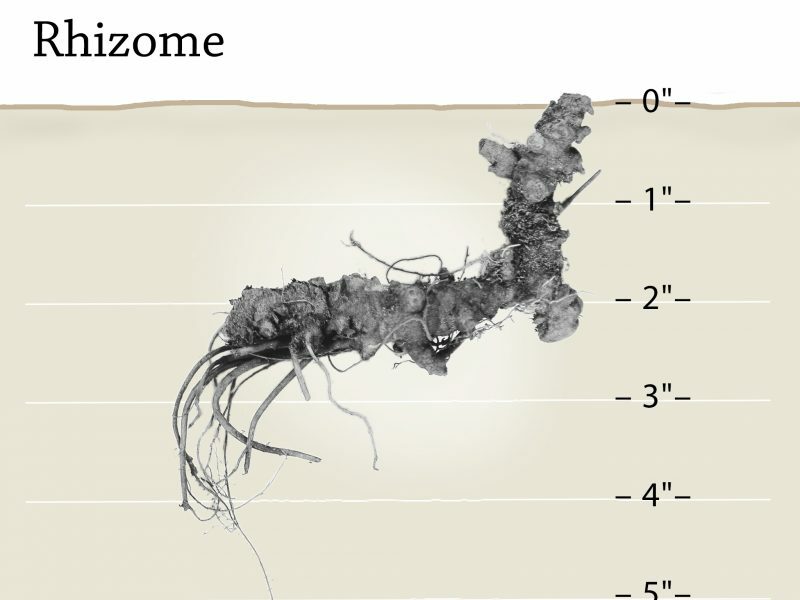 RHIZOME: A rhizome is a modified root that serves the dual function of storing plant food as well as absorbing water and nutrients. 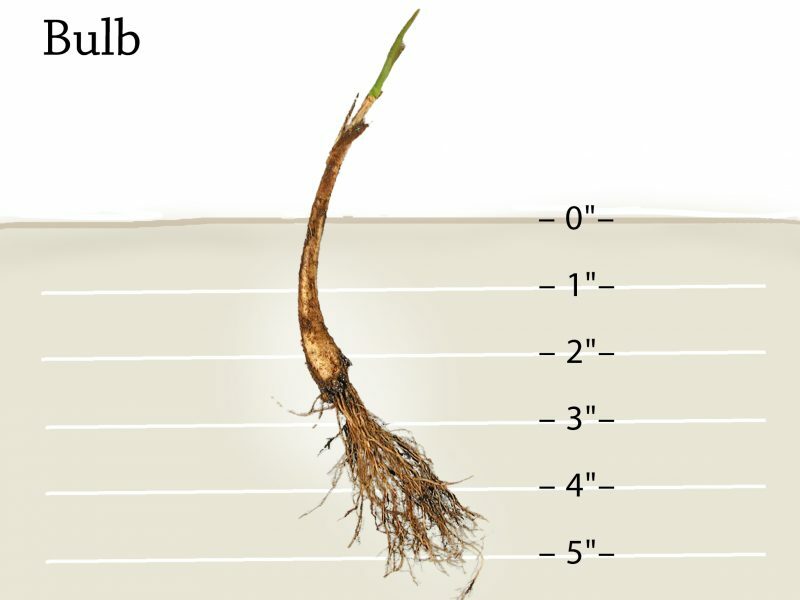 Rhizomes also act as agents for the spread of a plant. 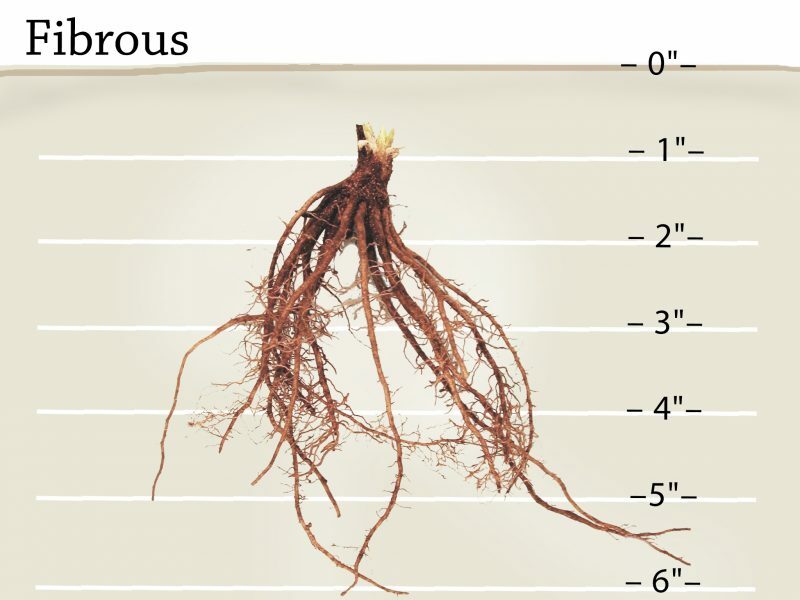 Planting depth: Plant rhizomes horizontally, one to two inches deep, with buds at or just below the soil surface. Attached feeder roots should be planted down into the soil. FIBROUS: These are characterized by numerous roots, emanating from the root crown (where the roots meet the buds). Planting depth: The dormant buds should be one inch below the soil surface. If leaves are present, make sure that they extend above the soil line, with the root itself completely in the ground. CORM: Corms are modified stems that resemble bulbs. The only difference is that bulbs have scales, while corms are solid when cut in cross section. Planting depth: Corms should be placed so the top of corm, the end with the buds, is two inches below the soil surface. Sometimes it is difficult to tell the roots end from the bud end, making it hard to tell which end is up. The roots are dark and wiry. The buds may have a pinkish color, but are often obscured by the previous year’s brown-colored old growth. BULB: Bulbs are roots adapted to store nutrients and moisture during periods of plant dormancy. Most bulbs produce off shoots to generate new plants to ensure longevity. Planting depth: Bulbs should be planted so that the white part of the plant is below ground, with any green growth being above the soil. 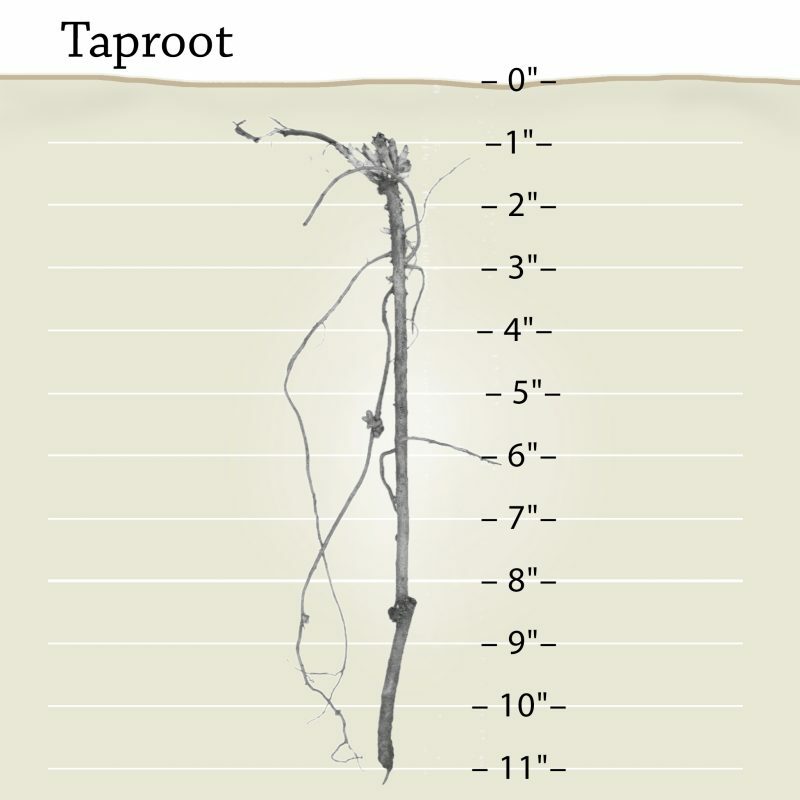 TAPROOT: Taprooted plants have one or more strong, main roots that go deep into the soil. This allows them to reach far below the fibrous rooted plants for moisture and nutrients. Taprooted wildflowers like Lupine, coexist well when planted with fibrous rooted grasses and flowers. Planting depth: The dormant buds should be one inch below the soil surface. If leaves are present, they should extend above the soil surface, with the root itself completely covered. Explore all of our native plants, wilflowers, ferns, shrubs and more at prairienursery.com.